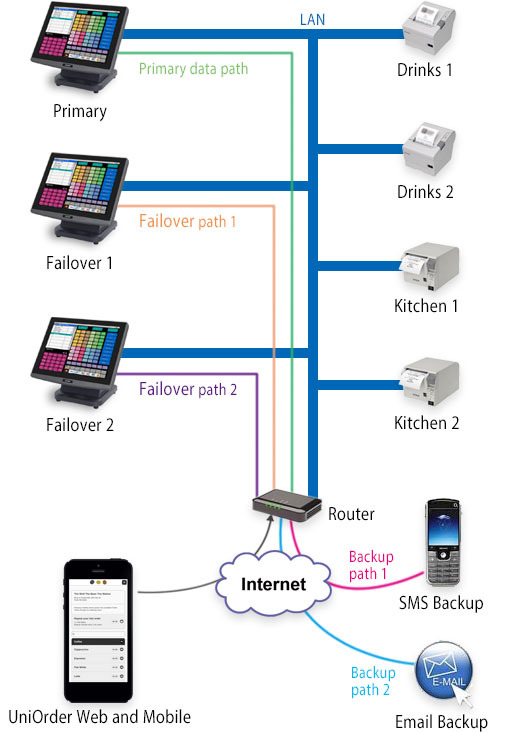 Uniorder is Web-ordering system can be interfaced with Uniwell POS systems. pickup/take away : customers simply order and collect. Dine-in: Customers can place their own order from tha table. Delivery: Customers order for home or office delivery. Catering:Corporate catering, bulk orders and advance sales for pickup or delivery. 1. Order is placed in Uniorder. 2. Order is sent to customer internet address. 3. Customer router forwards the order to the primary register. 4. The primary register sends the order to the designated printers. 5. The order is automatically finalized against a pre-determined media. 6. In the event of the primary register being unavailable to accept the order, the order will be routed to assigned failover registers after a time-out period.